Neighbor Kitty wrote to tell us about her consistently great experiences in our Elston Avenue, Chicago store. Not only does she mention the very knowledgeable John, who has helped her countless times with her pets, but also Harry, who's about to start his second career working with military and enforcement dogs. You see, when Harry was in the service he had a military dog. Harry's dog's story didn't have a happy ending, and Harry is looking to devote time and energy to make sure other military dogs do. Save-a-Vet rescues unadoptable service dogs and shelters them with disabled veterans for mutual healing and support. The whole Pet Supplies Plus organization felt like that was a cause we could get behind. Here's Kitty's praise of John and Harry. We couldn't agree more! 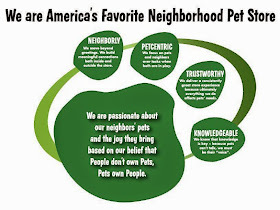 I have ALWAYS appreciated your employees at this location – their knowledge, their helpfulness, their willingness to go at length to educate me about the pets I am about to purchase as well as what works and what doesn’t. (I wouldn’t have my beloved finches if it weren’t for John, who has been with the store 8(?) years and helped me decide—and maintain their health. He is an EXCELLENT employee and an exceptionally hard worker). But I am also writing about your exceptional manager Harry Thomas, who will be moving on to what appears to be his second career (after retiring) to work with military and enforcement dogs (as I believe he did in the past.) He is an amazing person with such happy employees, and it appears that Harry at the helm was the main reason for their happiness. Thank you for Harry! But a special thank you for your donation to SaveAVet.org and making the drive country-wide. I hope it was Harry’s influence that caused you to select that charity! A company that gives back is one I want to buy from…always. So thanks again! Read more about Save-a-Vet's mission and the great things they do by clicking here.